.Wisdom, in both its divine and human forms, has long been part of both Jewish and Christian traditions. A whole section of the Old Testament is known as the Wisdom literature. The relative books are: Job, Proverbs, Ecclesiastes, Sirach (also known as Ecclesiasticus), the Wisdom of Solomon, and what are known as the Wisdom Psalms such as 33 and 107. The New Testament as we shall see absorbed many of the Old Testament themes. Let us have a glance at each of these books. Job, dating from the.tenth century B,C, is a philosophical and theological reflection on why the righteous suffer. The answer is that this is an orderly made cosmos and ultimately all injustices will be turned to good. Proverbs, written in its final form in the third century B.C. is a collection of aphorism and poems within the relationship between wisdom, righteousness and religious devotion. The book of the Wisdom of Jesus ben Sirach, also known as Ecclesiasticus, and written in the second century, is similar to the book of Proverbs with its advice on understanding God's law that makes possible a good life under the authority of God. Although Ecclesiastes, written in the fifth century B.C is the most pessimistic book in the bible the author does lead us to God as it is only in Him that we can be delivered from the vanities of this world. In the Wisdom of Solomon, finalised in the first century B.C. there is an extended discussion of the principle of wisdom and of the meaning of human existence. It especially contrasts the life of the righteous with that of the wicked in its opening chapters the righteous will know immortality while the wicked will face judgment and condemnation. From the human dimension wisdom can be thus viewed as the ability to establish a practical and meaningful relationship between one self and God, other human beings and the world in general. It is concerned with everyday life, how to live well and in an harmonious relationship with all. For example in Sirach, we find such sensible community advice as "Do not find fault before you investigate; examine first and then criticise. Do not answer before you listen, and do not interrupt when another is speaking. Do not argue about a matter that does not concern you (11.7-9). Thus Wisdom literature is grounded in social structures such as the family, school and royal court. One of the aims of Wisdom sayings is to help individuals to make right choices. Being wise is opposite to being foolish. The wise searches for God in order to live well; they seek instruction, wisdom and understanding to learn God's commandments (Prov. 1.2,3.1). However the foolish do not recognise God as the creator and therefore see no reason to live in harmony with His world and overcome sin. Wisdom (identified with the Word or Logos) is also personified as a divine and mystical being in Wisdom literature. Indeed it is closely associated with God Himself. Wisdom is the emanation of the divine plan by which this universe is directed. In Proverbs (8.22-36) Wisdom is depicted as having been with God before creation and indeed is his co-worker in creation. This theme is also in Wisdom when it records that "all things" were made by the "word", and "he created all things that they might exist" (1.14), while the opening chapter of Sirach declares, "wisdom has been created before all things." I came forth from the mouth of the Most High, And covered the earth as a mist. I dwelt in high places. And my throne is in the pillar of the cloud. Alone I compassed the circuit of the heaven, And walked in the depth of the abyss. He created me from the beginning of the world. And to the end I shall not fail (24.3-5). Wisdom as a divine person continued in the New Testament. The Prologue of John's Gospel intimates this in the opening sentence. "In the beginning is the Word and the Word was with God and Word was God". It also not only echoes the opening line in Genesis, but also from the above verses from Proverbs and Sirach. Many other images from Wisdom literature found their counterparts in the New Testament. John's gospel is particularly rich in them. For example when John speaks of Christ being the bread of life (6.35) he is drawing on those passages from Sirach 15.3, 24.21. 29.21; Proverbs 9.5; and Wisdom 11.4 that state Wisdom is the bread or sustenance of life. Similarly Christ as the light of the world (8.12) has its origin in Wisdom is light (Wis.7.26-30 and 18.3-4); Christ as the door and the good shepherd (10.7, 11.14) in Wisdom is the door and the good shepherd (Pro. 8.34-5,Wis. 7.25-7,8.2-16, Sir.24.19-22); Christ as the way (14.6) in Wisdom is the way (Pro.3.17,8.32-4, Sir. 6.26). There are more examples if you care to read these books carefully showing how Christ personifies Wisdom. Paul too personifies Wisdom. In I Corinthians 18-30 Christ is identified as the "power of God and the wisdom of God." Indeed Paul narrows this to Christ the crucified. Although this is "foolishness" to the Greeks, to those who believe in Christ it is "strength". "For God's foolishness is wiser than human wisdom, and God's weakness is stronger than human strength." What Paul is also intimating that if we were wise we would embrace the Wisdom of God, and to know nothing but Jesus Christ and him crucified. Our human wisdom will never lead us to heaven. Colossians depicts Wisdom as "the image of the invisible God, the first born of every creature" which has created "all things in heaven, and in earth, visible and invisible, And he is before all things, and by him all things consist." How similar these words are to Wisdom is "a spotless mirror of the working of God, and an image of his goodness." And "for he created all things that they might exist" (Wisdom 7.26, 1.14). From these passages and other references in Romans, Galatians, Ephesians, 1 Peter and James it is clear that the early Church saw Wisdom personified in Christ. 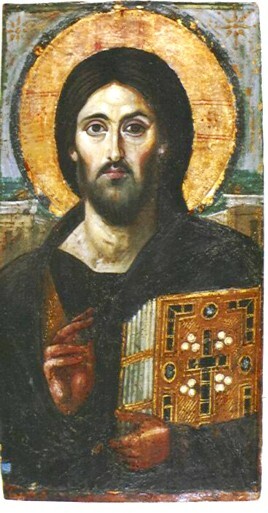 The early Church Fathers' theology expressed Wisdom as Jesus Christ, the eternal son of the Father and co-creator of the universe This theology has continued in the Orthodox Church which addresses Christ as the "Wisdom, Word and Power of God" before the reading of the Gospel.